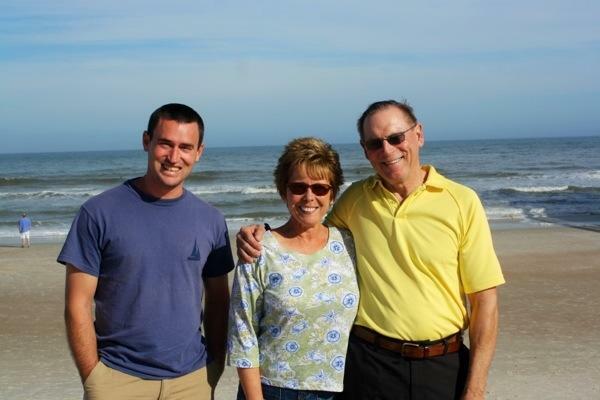 Brian and I had a delightful day touring St. Augustine with our hosts and expert tour guides, Bob and Susan. We first explored Porpoise Point. Bob showed us where he sails out of Camachee Cove, just north of the Route 1A Francis and Mary Usina Bridge. Vehicles are allowed on the beach at Porpoise Point and so Bob drove us out to the end of the point. 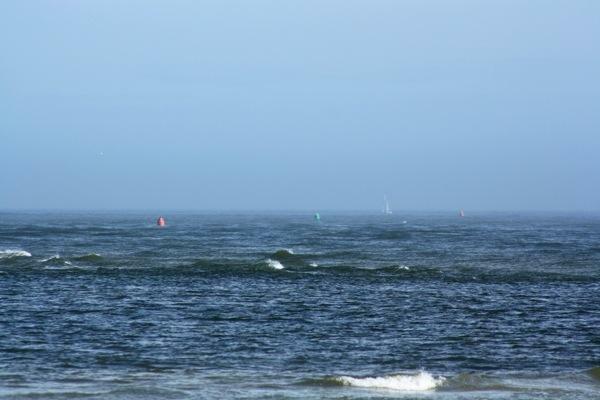 We had a good showing of osprey fishing in the surf; they seemed to have better luck than the fishermen. The black birds, however, were scrimping and scraping for anything they could wrap their beaks around. We decided to call them “shiny” black birds because of their lustrous teal feathers. Porpoise Point also offered a lovely view of the “doomsday” St. Augustine Inlet (where Serendipity was rescued). We scanned the inlet to find all the navigational buoys. It looks to be quite a ride with rushing, swirling currents through narrow passages and around breaking waves. Brian and I studied this for potential departure. 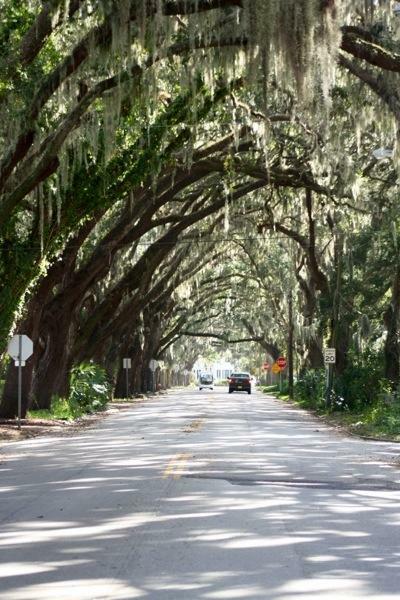 From Porpoise Point, Bob took us along St. Augustine’s most beautiful road through town and onward toward Anastasia Island. Brian and I were gawking at the palm tree lined streets – we’re actually in palm tree territory! Farthest south EVER! We stopped at the St. Augustine Lighthouse. Before we could ask why it is set back so far from the water, Bob was already explaining that the coastline here had actually built in during the years since the lighthouse had been erected. 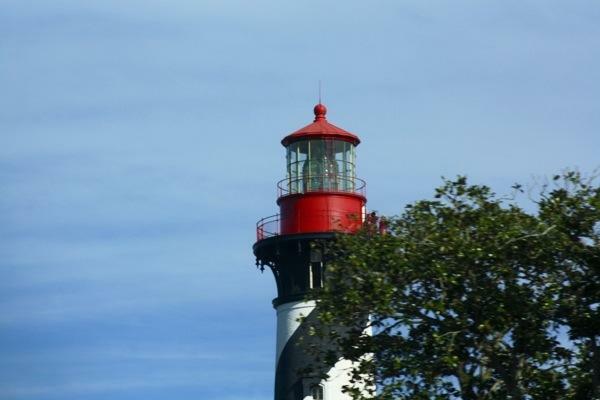 Susan noted that the lighthouse preservation has a fantastic following and hosts many events. She recommends the Sunset Moonrise event, held monthly during the full moon. Must be a great view! On the way back to Bob and Susan’s house, we asked if we could stop at a surf shop to get me outfitted with snorkel gear. (Brian won’t let me leave the states without it!) At the surf shop I found a mask with snorkel that fit perfectly. And then to find flippers. 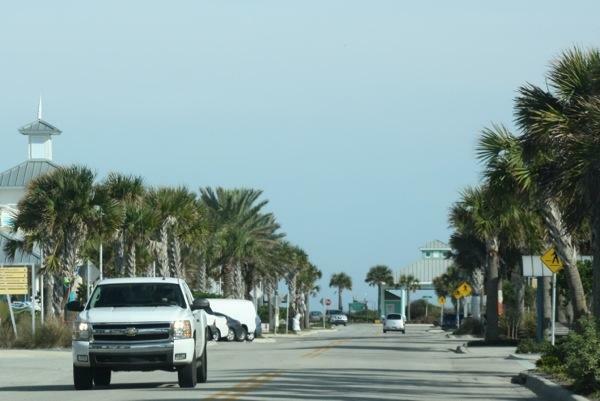 This soon became a mission as we stopped at every surf and dive shop on our way off of Anastasia Island. We learned that I was not looking for flippers, in fact the correct term is swim fins. We learned that there are various shapes, sizes, and weights of swim fins and that none of the up-scale surf shops carried the leisure flippers I was envisioning. At what we hoped would be our final stop, another very helpful attendant explained the differences between the various swim fins on display that ranged from $90-$200. When he realized that nearly custom fins weren’t in our budget he directed us to Target. Target! Never would I or Susan have thought to look there. That was the best advice we’d received yet! Target had a packaged mask, snorkel, swim fins set priced at $11. Now we have a spare mask and snorkel (for future visitors) and a storage bag loaded with accessories! The snorkel success was well worth celebrating over one of our favorite meals…PIZZA! 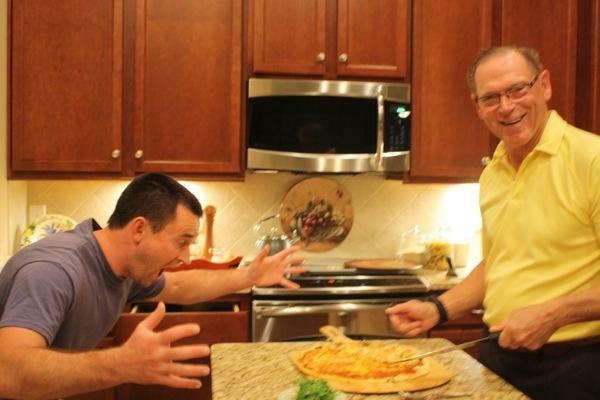 But not just any pizza, oh no, this was homemade gourmet style. Delicious! After such a wonderful day, we may never leave St. Augustine! 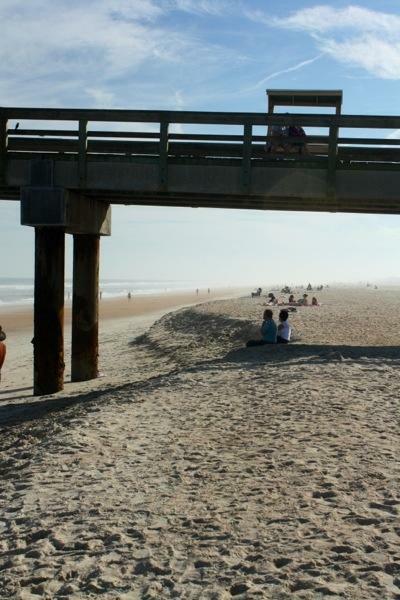 This entry was posted in Uncategorized and tagged anastasia state park, porpoise point, snorkel, st augustine lighthouse, swim fins by stephanie. Bookmark the permalink. 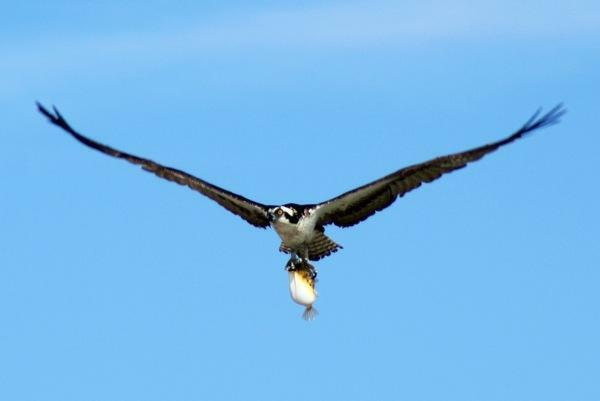 About the birds – the Osprey is terrific to watch while fishing. I saw them often in the summer in Seattle, hovering above the water and then diving at high speed to get a fish. That’s a very nice photo you got. 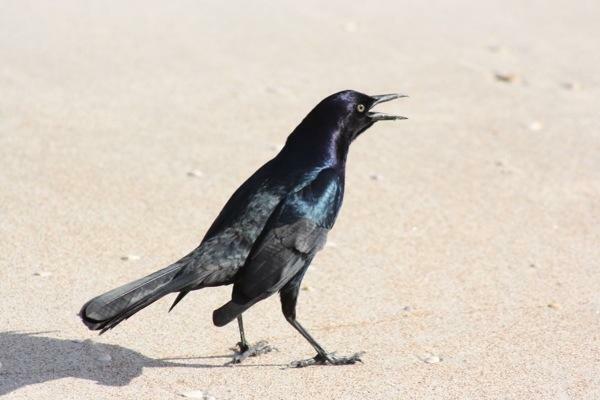 The purple bird is the Common Grackle, although there are a couple of other grackles that are in Florida. Very, very noisy birds. I see them a lot when I visit Fort Worth, Texas. Don’t see them much in Ohio. We have Osprey in Missoula. They fish in the Clark Fork. We named our baseball team after them! That is a great picture!